What does Vitamin K do? What foods is it in? You kind of have to feel sorry for Vitamin K. It appears to be the least popular vitamin, and many people don’t even appear interested in getting to know it better. If Vitamin D is the life of the party, Vitamin K is standing by the punchbowl, futilely attempting to make small talk with other guests. I would definitely suggest being familiar with it, though, since this nutrient plays a very important role in blood clotting and bone density. You may wonder why its blood clotting properties are perceived as beneficial, particularly when one of the outed benefits of Omega-3 fatty acids is their blood thinning properties. We come back to the ever-present ideal of balance. Over-thinning of the blood is problematic, as it increases the risk of internal bleeding. Additionally, without blood clotting factors, something a small cut could result in excessive blood loss. Vitamin K helps with bone density by regulating calcitonin, a protein that locks calcium in the bone matrix, thereby making it more difficult for cells known as osteoclasts from breaking it down. If osteoclasts are more active than osteoblasts (which help create new bone tissue), your risk of osteoporisis increases significantly. What’s interesting about this nutrient is that we get it two different ways. K2, the more biologically active form, is synthesized by beneficial bacteria in our intestinal tract. Since babies start off with bacteria-free intestines, they are given a Vitamin K shot within hours of being born. 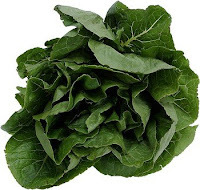 The plant form — K1 — is found abundantly in leafy green vegetables. Although our intestinal bacteria produce some Vitamin K, we still need to get some from our diet. A mere half cup of steamed kale, spinach, and collard greens each pack in six times the Daily Value! A single cup of raw romaine lettuce provides three quarters of a day’s worth. Anyone who has ever been on blood-thinning medication (i.e. : warfarin, more commonly known as Coumadin) has been told to be mindful of their Vitamin K intake so as to prevent unwanted drug-nutrient interactions. A lot of people inaccurately think that the best thing to do when put on warfarin is completely eliminate Vitamin K from the diet. Not so! The key is to keep vitamin K intake consistent. Suddenly increasing Vitamin K consumption renders Coumadin ineffective, whereas decreasing it too much in a short amount of time will overly thin the blood. Therefore, when on antibiotics, do not drastically alter your Vitamin K intake. A clinical dietitian I know at New York City’s Memorial Sloan Kettering Hospital recently told a most interesting anecdote about a patient who was put on coumadin. A dietary recall revealed that her diet was very high in Vitamin K. Not a problem, but definitely important in the scheme of things. Soon thereafter, she fell very ill, to the point where she stopped eating. Mind you, she was still on Coumadin. In other words, her vitamin K drastically decreased (from about 1200% of the Daily Value a day to absolutely nothing). To counteract the illness, she was given antibiotics (remember, she is still on Coumadin). The antiobiotics wiped out gut flora. So, she now had a high Coumadin dose (based on her standard Vitamin K intake) but no Vitamin K from her diet OR her intestinal tract. Not surprisingly, she bled internally and had to be rushed into surgery. According to this article, women who consume junk food while pregnant may be putting their babies at risk for craving overly sweet and salty snacks as children! Well, at least that’s what researchers in Great Britain’s Royal Veterinary College are guessing might occur based on a study they performed on… rats. Turns out the pregnant rats who had the least healthy diet gave birth to little ones who craved junky snacks. There is one major flaw with this study, though. Unlike the rats in this study, human babies are not given free reign to eat whatever they please. Human mothers are instructed to start their babies off with certain foods and slowly introduce new ones with time, not leave a box of Dunkin’ Donuts on the counter and see if two-month-old Jessica reaches for them. If anything, what truly determines the possible pattern of a child’s dietary habits as they grow older is what they are fed at home. A toddler living in a household stocked with TV dinners and Doritos bags has no interest in vegetables because he has no idea how they taste. Similarly, a first grader’s daily fruit intake should not be a Fruit Roll-Up. Of course children should have and enjoy treats, but these formative years are key for introducing them to new foods, flavors, and textures. Our experiences with food as children have far-reaching consequences, well into our adult lives. Look at your own dietary habits and preferences. Can’t many of them be traced back to family traditions and tastes? In any case, pregnancy is a time when rare cravings can occur, and I would hate for a first-time expecting mother to think her midnight vanilla ice cream and pickle snack is dooming her future child’s health. Once children can be fed a variety of foods, though, mothers should not be discouraged by an initial dislike. It often takes eight or nine tries of a new food (i.e. : broccoli) before a child truly accepts it. For the record, nutrition authorities aren’t putting their eggs into this basket.